Sit in your living space around this stylish central table. The round top and metal frame convey a sleek and simple look. The Novello Central Table by Natuzzi Editions at HomeWorld Furniture in the Hawaii, Oahu, Hilo, Kona, Maui area. Product availability may vary. Contact us for the most current availability on this product. Wood & Finish Black Finished Metal Frame. Bronze, Dark Emperador, Brown Oak Top Finishes. Bring modern style into your living room with the Novello occasional table collection. 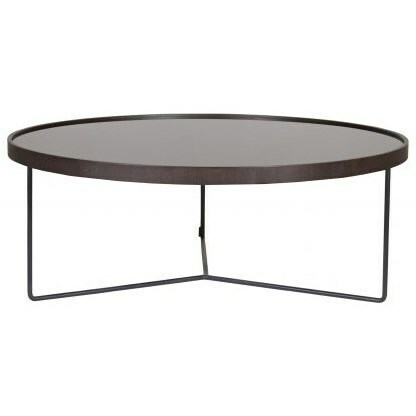 The black finished frames of each table support round tops that are available in three finishes: Dark Emperador marble, Bronze finished glass, Tobacco Oak wood. Accent your space and find the perfect place to set items down with Novello. The Novello collection is a great option if you are looking for Contemporary furniture in the Hawaii, Oahu, Hilo, Kona, Maui area. Browse other items in the Novello collection from HomeWorld Furniture in the Hawaii, Oahu, Hilo, Kona, Maui area.